This is my most favouritest, bestest, end-of-summer sandwich EVER! I can’t wait for this time of year. Finally! The tomatoes are ready! Nothing tastes better than a tomato, warm from the sun’s rays, picked and sliced, a splash of olive oil a sprinkle of Fleur de Sel…. Toasted whole wheat bread, a light coat of mayo, whole basil leaves, sliced tomato, both freshly picked from the garden, perfectly ripe avocado, sliced, not too thinly, and a broke yolk fried egg topping it all. A grind of fresh pepper a sprinkle of salt…. Oh yeah I am soooo happy right now! The mix of flavours just works for me! 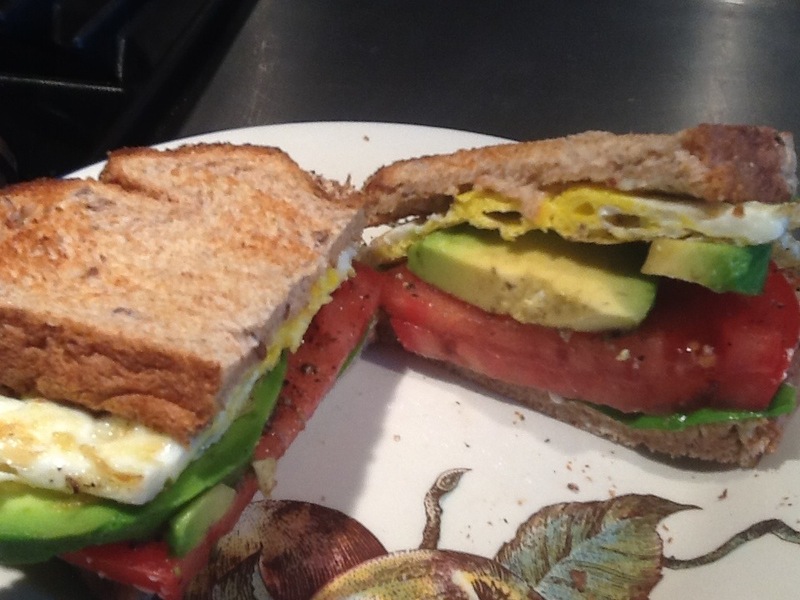 This entry was posted in My recipes and tagged avocado, egg, Tomato. Bookmark the permalink. Me too… so good and so good for you!